Many people struggle with focus at this time of year. I was definitely feeling it as the week started because I’m coming off a week of vacation followed by several days of illness. I know I’m not alone. For many people, vacation is over and its tough to get back in the routine of work. For others, vacation is imminent and its hard to focus when (fill in your destination) is calling. Here is Central Ohio, school starts in two weeks, so parents have a lot on their mind; getting schedules organized, those seemingly endless school supply lists, clothes shopping for their growing kids, and more. At the same time, this is the middle month of the third quarter. Goals that have not yet been met at work are looming large. Some of us have had to put in extra hours to cover for staff on vacation. Depending on your industry, you might also be busier than normal during the summer. If you’re in sales, the heat is on to get those new accounts on the books by year end. Customer service staff may be dealing with grumpy customers who are tired of the hot weather. I went back to the reliable “To-Do List.” I sat down Monday morning and made a list of all the things I need to do this week, both personally and for my clients. Then I marked which ones were non-negotiable. Then I prioritized that list and highlighted the ones I wanted to get done on Monday. Instead of getting right to work, I took a minute – well, really about 15 minutes – to enjoy one more bit of vacation; a cup of coffee on my patio before it got too warm outside. That also gave me the opportunity to take some pictures of the beautiful red strawberries and colorful flowers we’re enjoying. It felt like a real indulgence on a workday. Then, I attacked my list. An hour later, I had already completed my top two priority tasks and was back in the groove. How do you regain your focus and drive in these dog days of summer? 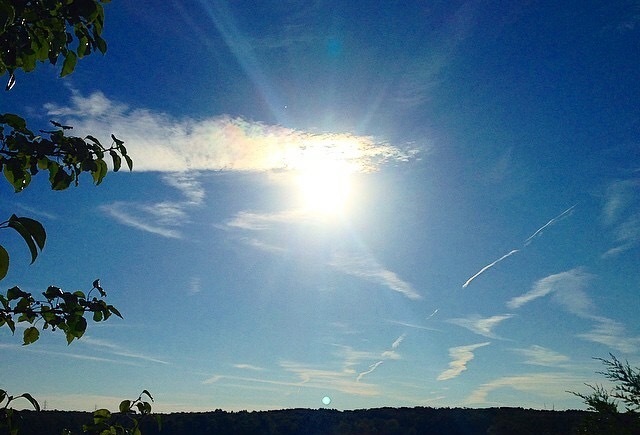 Photo credit: Taken by El Biddulph at Hoover Reservoir, Ohio, August 2014.